There are at least 5 ways of how to suppress warnings in GCC and Clang. This article explains these 5 ways, which are writing different code, __attribute__, _Pragma, #pragma, and command line options. TL;DR: If possible, write better code, otherwise, if possible, use __attribute__, else use _Pragma. We have to implement an interface and do not need all of its parts, for example not all function arguments. We get conflicting warnings from different compilers. I want to showcase all 5 different ways how to deal with compiler warnings in GCC and Clang. For that, I will use the following sample project. The parameter argc of function main is not used. We can, however, not drop it, as this would be against the C and POSIX specifications. And both, GCC and Clang, know that. You would get -Werror=main warnings if you try to remove argc from the signature. One way to avoid warnings is to write different source code. In general, avoiding warnings by writing better source code is the preferable way. But note the subtle difference between the words different and better. Source code is not necessarily better just because it's different, even if it produces fewer warnings. This is an excellent example for one of those rare situations where different with fewer warnings does not mean better. This compiles just fine with make. But the for-loop is more complex than the previous while loop. And at least on an AMD64 instruction set, GCC and Clang will emit bigger, more complex code. Discussing the details of this is a story for a different time. But in this case, the for loop is not better than the while loop. We've made the code worse just to get rid of a compiler warning, which is not good. If your code gets better when getting rid of a compiler warning, changing the source code is the way to go. If you can't find a way of how to get rid of a compiler warning by making the code better, you need other options. Writing different source code is a potential risk. How do you know that the different code behaves the same way as the old code? You could possibly introduce bugs, so be careful. Best, have tests which will cover your change. As we could see, changing the source code does not always lead to better solutions. Other approaches are required. C compilers cannot have a holistic knowledge and understanding of a software project. The feedback they give is based on the input files only, nothing else. Some compiler warnings would go away if we would give the compiler more information. The C language defines a number of specifiers which programmers can use to give the compiler more information. _Noreturn is such an example. By taking a closer look at the C language, you may discover a keyword that's use will do two things: Make your source code more correct, and because of that, also remove the warning that you're looking at. You can read more about _Noreturn and other specifiers in the Programming Languages — C specification. The information that we want to give to the compiler may not (yet) be supported by the C standard. Compilers can implement their own ways of how to provide additional information. In the case of GCC and Clang, that is __attribute__. __attribute__ will not really suppress a warning. With __attribute__, we can give GCC and Clang information to understand our source code better. And with that better understanding, a warning can go away. In this case, we want to tell GCC and Clang that the parameter argc is not used. So we add __attribute__((unused)) to the declaration of the parameter argc. If an attribute is used frequently, it can be useful to declare a macro for it. The macro can also be useful if you need to deal with different compilers and some of them do not support __attribute__. I name the macro A_Unused and think of it in a similar way as annotations in languages like Java. A macro can also be useful in case you want to write portable code. Other compilers might not understand __attribute__ and trip over it. Defining the macro empty for other compilers can help writing portable code. You can read more about __attribute__ in Using the GNU Compiler Collection (GCC) and the Clang Compiler User's Manual. They both work pretty much the same way, just the syntax of how to get it into the C file is different. The expression-like _Pragma() is newer, it was introduced in C99. You might wonder if you need to replace GCC with clang in case you use Clang instead of GCC. No, you needn't. Clang understands these GCC pragmas just fine. You could replace clang with GCC. But clang only works for Clang, and GCC works for both, GCC and Clang. The _Pragma() operator was added to the C standard for version C99 (ISO/IEC 9899:1999). Because it is an operator, it can be used in macros. 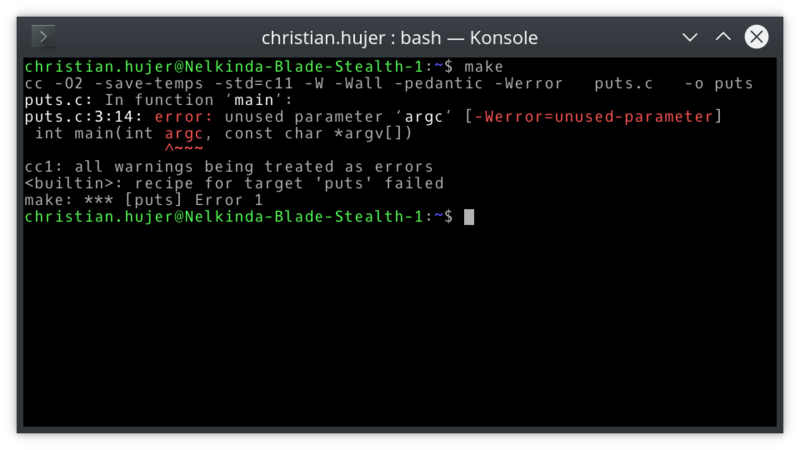 You can also suppress warnings in the Makefile. This can be done on a per-file basis. More generally speaking, you can alter variables on a per-file basis. The variable CPPFLAGS controls the command-line options for the C preprocessor and compiler. Listing 3-7: Makefile that suppresses the warning for one file. We've seen different approaches to addressing compiler warnings. Let's recap and summarize. The best approach, if you have tests, is to refactor the code to be even better and not have warnings. If you do not have tests, be aware of the risks of that approach. The second best approach is to give the compiler more information. The source code of all examples is available on GitHub. Open Source Compiler front end to LLVM designed as drop-in replacement for GCC. Supports a large variety of CPU architectures. The major languages supported by Clang are C, C++, Objective-C, Objective-C++, OpenMP, OpenCL, and CUDA. Open Source Compiler Collection by the FSF. Originally developed by Richard Stallman and first released as part of the GNU project in 1987. Supports a large variety of CPU architectures. The major languages supported by GCC are C, C++, Objective-C, Objective-C++, Fortran, Java, Ada, and Go. Compiler infrastructure for developing compilers. Used by Clang. Using the GNU Compiler Collection (GCC) (URL: https://gcc.gnu.org/onlinedocs/gcc/) , Free Software Foundation, Inc.